Few things are more challenging for the Army than being ready to fight today while simultaneously preparing for an unpredictable, constantly changing future. The evidence of these two competing requirements is all around us, as the Army works to regain combined arms maneuver proficiency after focusing on counterinsurgency operations in Iraq and Afghanistan, all the while remaining heavily engaged in both those places and several others. The inherent tension between present requirements and future demands is very real. We continue to fight with aging equipment while technology rapidly advances and declining budgets hamper our attempts to modernize. While we balance future requirements against current readiness, the world gets more unstable as our competitors focus on ways to develop regional advantages by increasing their own military capabilities. In a world filled with risk, however, our fellow citizens expect their Army to be ready to fight and win at any time, whether today or 25 years from now. Meeting these expectations is the primary mission of the U.S. Army Training and Doctrine Command (TRADOC). 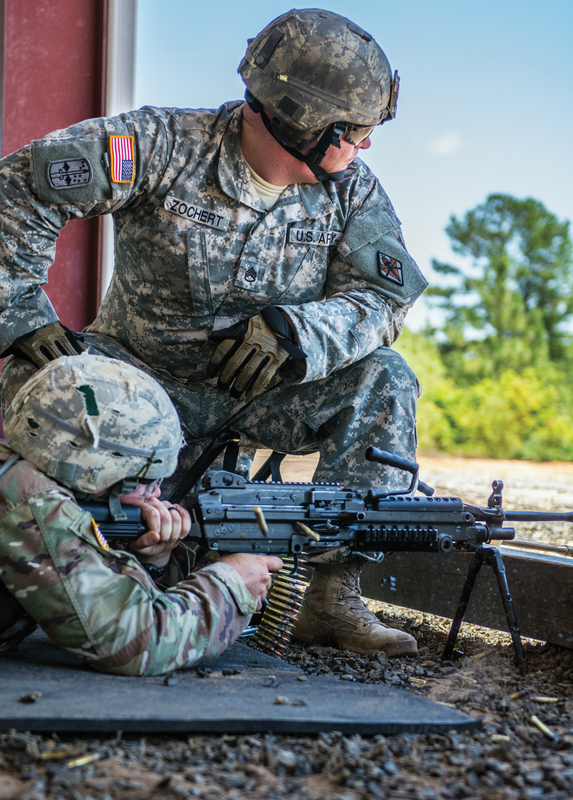 A soldier’s aim is observed during basic combat training at Fort Jackson, S.C.
TRADOC thinks about the future in ways informed by, but not captive to, past experience. Moreover, knowing that any unwise investments in our people, organizations or materiel are not easily reversed requires that we expend tremendous time and effort on better understanding the future environment, so as to clearly identify the myriad challenges we will confront one day. TRADOC’s unique capacity to provide context and perspective on these challenges gives us a crucial role in thinking through the long-term effects of today’s decisions as well as helping the chief of staff of the Army and Army Staff balance current readiness with future force requirements. TRADOC takes a balanced approach to the demands of today and tomorrow, continuing to provide readiness today while preparing the future Army to win decades from now. We do this job in the full realization that at any moment, the Army must be ready to act anywhere on the globe, across the entire range of military operations. Our perspective, therefore, must be equally broad. Getting the big issues “about right” prevents us from making mistakes from which we cannot easily recover. Our approach maximizes options and flexibility for our civilian leadership, ensuring we can adapt for success in a world full of surprises. Sgt. 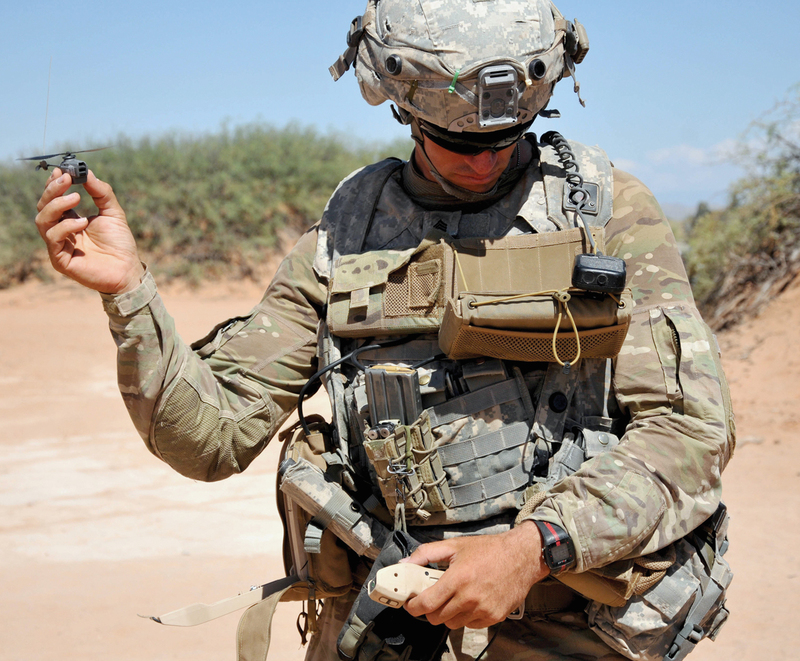 Zachary Howard of the 4th Battalion, 17th Infantry Regiment operates a pocket-sized drone during testing at Fort Bliss, Texas. There are many ways TRADOC does this right now. One of these is by ensuring we have the right doctrine for the operational environments in which we expect to fight. TRADOC is revising Army Doctrine Publication 3-0: Unified Land Operations, and Field Manual 3-0: Operations, to ensure the Army is prepared to win in an unpredictable, constantly changing world. One of the big ideas we are exploring is the operational concept of multidomain battle, which recognizes the inherently joint requirements of the interconnected air, land, maritime, space and cyber domains. The Army must aggressively operate in all of those domains if we are going to play a significant role enabling joint combined arms maneuver. Put simply, Army forces will maneuver to positions of relative advantage and project power across all domains to ensure joint force freedom of action. We will do this by integrating joint, interorganizational and multinational capabilities to create windows of domain superiority to enable joint force freedom of maneuver. Joint commanders will then exploit those windows of superiority by synchronizing cross-domain fires and maneuver to achieve physical, temporal, positional and psychological advantages. Army forces serving as part of the land component will set conditions for air, maritime, space and cyber operations, while operators in those domains will do the same for land forces. The interconnected nature of the world demands interconnected, joint solutions that create multiple dilemmas for enemies focused on single solutions such as anti-access/area denial or elaborate integrated air defense systems. While no other armed forces “do joint” like we do, there is always room for improvement. Multidomain battle will make us even more effective, with the added benefit of increasing our ability to deliver deterrence with conventional forces. In the long run, we’ll need to design a force optimized for such operations. As the architect of the Army, TRADOC is tasked with envisaging the future environment so as to identify capability gaps, analyze potential solutions and then determine requirements. To assist in this task, we introduced the Army Warfighting Challenges as part of the Army Operating Concept in 2014. These challenges provide an analytical starting point that acts as a forcing mechanism for an integrated, broad-based approach to our future force development. As such, the challenges are helping us focus on the big problems the Army needs to solve. To ensure we are developing coordinated and effective solutions, we are also employing every part of the Army—across all three components—to help solve them. As leaders take on the task of working through issues affecting readiness, modernization and leader development, we are encouraging them to use the think-learn-analyze-implement paradigm. Such an approach helps to structure our thinking and make the best use of scarce resources—particularly time. As a result of this methodology, and by placing an emphasis on completing the learning and analysis well before implementation, we are finding out what works and will not work early in the development process. Sprinting toward the finish of a regimental run at Fort Knox, Ky., are cadets with Bravo Company, 9th Regiment Advanced Camp. In effect, the Army is learning that if something is not going to work, it is best to “fail fast and cheap.” By avoiding the slow, expensive failures of the past, we are saving money and time but most importantly, we are hastening the process of improved systems and doctrine finding their way to the field. To help build the future Army, TRADOC is managing a collaborative effort across the operating and generating forces, the joint community, industry and academia. Together, we are moving forward on overcoming the capability gaps already revealed by ongoing analysis of the warfighting challenges. This is, of course, a dynamic process, and TRADOC is continuously updating force development plans as resources, threats and technologies change. Moreover, we are employing new learning activities such as the Army Warfighting Assessment, Pacific Pathways and the New Generation Warfare Study as well as previously existing events including Unified Quest, Unified Challenge and the Network Integration Evaluation to generate analysis informed by realistic environments. The Army Warfighting Assessment provides a demanding environment in which Army units can test proposed solutions to the warfighting challenges on a scale not easily replicated anywhere else. Pacific Pathways, an extension of the Army Warfighting Assessment conducted by U.S. Army Pacific, assesses our capabilities within the framework of the Army Operating Concept in the U.S. Pacific Command area of responsibility. Future assessments will continue to develop solutions to the warfighting challenges as well as the concerns of our Army service component commands. To lend structure to this enterprise, the capabilities required by the future force are being binned into categories—the Big 6 Plus 1 Capabilities. It is crucial to note that these proposed capability enhancements are not centered on materiel or the acquisition of new systems. Rather, they require input from across doctrine, organization, training, materiel, leadership and education, personnel, facilities and policy as part of a comprehensive strategy. Two recent examples of this new approach are our ongoing collaboration with joint partners on the Strategy for Robotics and Autonomous Systems and the Combat Vehicle Modernization Strategy. The Combat Vehicle Modernization Strategy is part of the overall Army Modernization Strategy, informed by the Army Operating Concept. It outlines near-, mid- and far-term priorities for brigade combat teams to ensure they possess the necessary mobility, protection and lethality we require in each type of formation. It will drive specific combat vehicle modernization plans by providing risk-based priorities that allow for the ebb and flow of resources, lessening the possibility that critical programs lose funding. Prioritization based on risk makes decisions about materiel solutions easier and more consistent. It is important to remember, however, that balancing readiness and building the future force both require more than good equipment. They require the right people. The U.S. Army Recruiting Command and the U.S. Army Cadet Command continue to provide the Army its most precious resource: people. To ensure this invaluable resource is prepared for the challenges ahead as well as to adapt the force to the opening of all combat arms jobs to women, TRADOC instituted the Soldier 2020 initiative. The cornerstone of this initiative is a gender-neutral Occupational Physical Assessment Test developed by TRADOC’s Center for Initial Military Training. 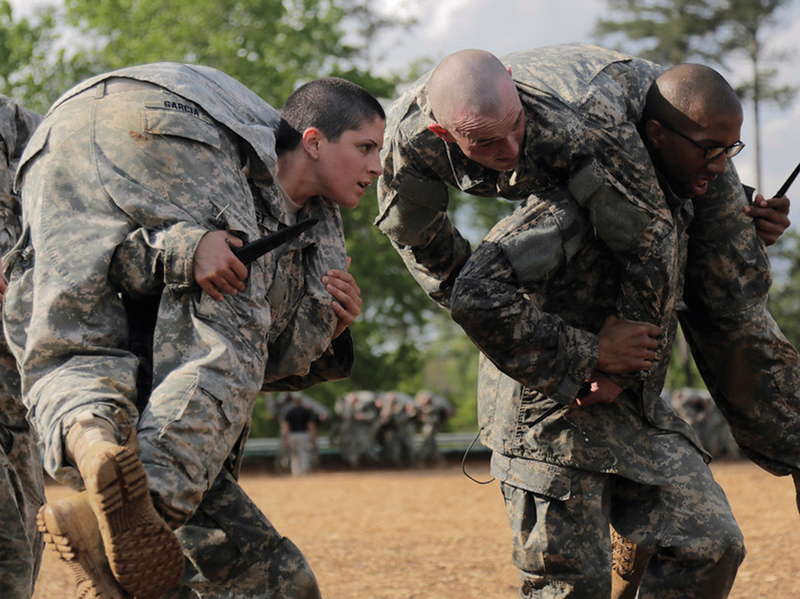 This test assesses a recruit’s physical fitness prior to initial military training and, when coupled with a recruit or candidate’s general technical score, allows the Army to “best match” the right person to the right job. Our goal is to reduce attrition as well as improve the success rate of new soldiers—regardless of gender—by ensuring they can perform the physical and mental tasks associated with their jobs. This year, the ROTC celebrated its 100th birthday. During the century of its existence, ROTC has commissioned over 1 million officers for the U.S. armed forces. As ROTC continues to evolve, Cadet Command is enacting initiatives that are improving officer quality while strengthening its partnerships with the 275 colleges and universities that host Army ROTC programs. In the forefront of ROTC’s evolution is the Cadet Character and Leader Development Strategy. This strategy is based on a new curriculum and a revised Cadet Summer Training methodology, which employs advanced educational methods designed to prepare cadets for the challenges of an increasingly complex world. Ranger students including Capt. Kristen Griest train at Fort Benning, Ga., in April 2015. All soldiers and officers entering the Army attend initial military training at one of eight centers of excellence across the Army under the direction of the Center for Initial Military Training (CIMT). They undergo CIMT’s recently revised Basic Combat Training Program. 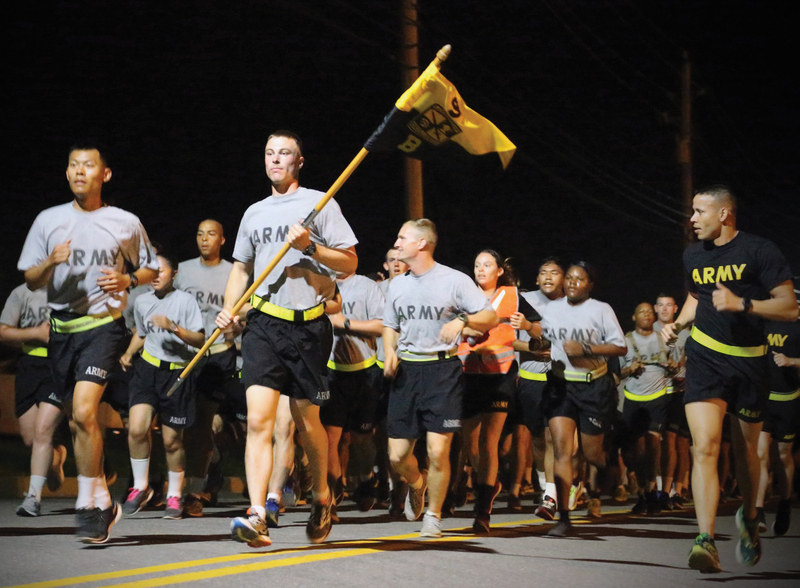 While all that was good in the original training program remains, an additional focus has been placed on Army Values, the arms profession, adaptability, and the employment of a more holistic approach to health and fitness. Not resting on its laurels, CIMT is also in the developmental stage of a Combat Readiness Test that will assess soldiers’ physical ability to execute the mission-essential tasks associated with their duty position. Leader development: If people are going to continue as our asymmetrical advantage, then leader development must remain the Army’s core task. Through the Army Leader Development Strategy and Army Leadership Requirements Model, TRADOC has charted the course. To make it work, we all must take passionate ownership of leader development at every level, from general officer to sergeant. To help leaders, who remain responsible for subordinate development, the Center for Army Leadership is exploring ways to improve the tools associated with the Leader360, Unit360, and the Leader Behavior Scale 2.0. The results from this study will be used to enhance the quality of feedback provided through the Multi-Source Assessment and Feedback model. Institutional agility: In addition to changes in training and education programs, we are also making Army doctrine more dynamic. By sharing knowledge between the Army’s operating and generating forces, particularly through our centers of excellence, TRADOC is accelerating the incorporation into doctrine of lessons learned, changes in the operational environment, force structure modifications, technology advancements and changing social mores. Moreover, as a result of improvements in our mechanisms for refinement and feedback, we are also getting better at capturing the essential information necessary for keeping our doctrine relevant. Realistic training: TRADOC will continue to make training across the Total Army more realistic, using organizations designed for that very purpose. The Center for Army Lessons Learned and the Asymmetric Warfare Group collect the most recent information available from operations around the world and share rapidly across the force as individual products and through the centers of excellence that touch all parts of the Army. TRADOC, via the Combined Arms Center-Training directorate, will continue to provide the training aids, simulations and other forms of support to the operational force necessary for the kind of training necessary to win in the unforgiving crucible of land combat. Much, if not most, of TRADOC is engaged in generating realistic training every single day. Contributing readiness and preparing the Army for the future are what TRADOC is for. By designing, accessing, training and constantly improving our Army, TRADOC is purpose-built to create readiness today while preparing our Army for the unpredictable and constantly changing future. 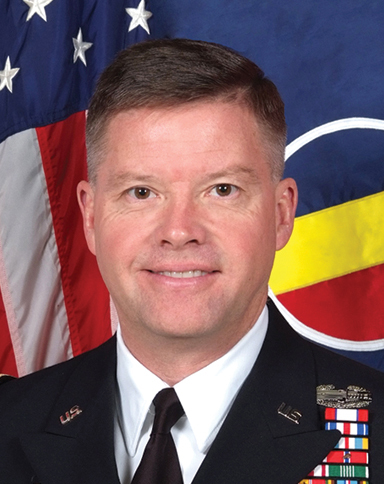 General David G. Perkins assumed duties as Commander, United States Army Training and Doctrine Command on March 14, 2014 after serving as Commander, United States Army Combined Arms Center, Fort Leavenworth, Kansas.